The Crosswinds furniture series meets virtually any small office or home office need. For busy computer users on the go, these compact, mobile workstations organize all your computer peripherals within tight space constraints and limited budgets. Crossroads workstations are designed to accommodate today's large computer monitors and tower CPUs. They feature numerous extras including slide-out keyboard and mouse trays. 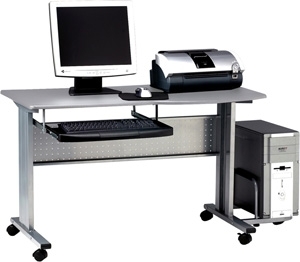 All workstations feature sturdy steel and laminate construction.